While the stock market has perked up slightly, the economy continues to be mired in a deep recession. Unemployment, housing and other measures are still negative with no real sign of improvement. Since 1900, there have been 22 recessions which works out to one about every 5 years. While recessions are labeled officially by the NBER, in January 2008 I pointed to a specific indicator which I believed meant that we were in a recession (by late 2007). A while later, this was confirmed by NBER. The outlier, of course, is 1929. The G-20 leaders huddled together in London to do everything to keep it an outlier and prevent an equally devastating world-wide depression..
At the start of the century there was a cluster of long recessions. 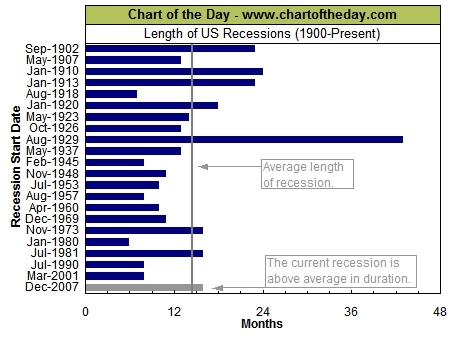 These 5 recessions all happened before 1930 and were also the longest in length. The next 70+ years saw much shorter recessions. Although you may think this was due to the institution of the Federal Reserve and its role in managing the economy, you’d be wrong. The Fed was created in December 23th, 1913. It was the SEC that came about as a result of the chaotic aftermath of the 1929 crash and ensuing depression. Here’s a chart showing the relationship between the unemployment rate and the stock market during the past few recessions. Notice how the “bad news” of a rising unemployment rate accompanies a rising stock market. In other words, the market discounts the future and starts to rally well ahead of the turning point in the economy. Haha, I love the last comment in your “we are in a recession” post from last year (linked above) - so typical of the Kudlow-vians throughout ‘08. There were so many excellent posts here and elsewhere at the time, but permabulls just stuck to their guns. Permabears are not immune from those types of mistakes.